Pugs 'N Pals: Sunny Needs your help! Poor Baby Sunny. I am sending a donation, but it isn't much. I wish I could afford so much more. Other than that all I can do is pray for this baby, along with Carina. I have pug who had a very successful shunt surgery. Sending Sunny lots of best wishes for a great surgery outcome! Great job Tina! Where would these vulnerable little creatures be without you! Thank you!! 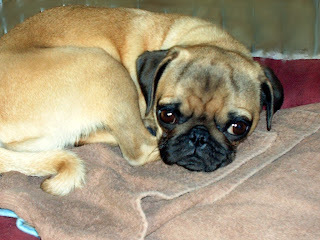 We've had many Liver Shunt Pugs. We've also been very lucky that they all but one were successful. It all depends how soon you catch it and how much brain/liver damage there is. We are hoping for the best for little Sunny and we will do everything humanly possible for her. Is there any news on Sunny? Please tell us that Sunny is recovering well. Could we please have an update on Sunny and Chance? This little girl is so PRETTY! She will gat adopted fast! Sunny was adopted GOOD FOR HER!!!!!! !